The problem with most modern analyses of politics is that they are described as dichotomous and linear when they might be better depicted as trichotomous and three-dimensional. That is, instead of a linear left/right divide—with the good guys in the centre (or, as the mainstream media would insist, slightly left of centre) and extremists on either the far-left or the far-right, casting the extremists on both sides as most different from each other—a better picture of the political spectrum is a coloured, solid model of a dipyramidal hexahedron of three main colours based mainly on the computer’s basic colours of red, blue and green, gradating towards white and black at the two apices. Red would comprise, for the most part (in basic, rather simplified terms), what is often termed the left, describing those who would give political authority to “the people”, particularly the workers or the proletariat. (Stalin’s political colour, for example, was darkest red—so dark it was virtually black.) Red politics, because of the supposed fraternity of the proletariat around the world, tend to be internationalist. Blue would comprise, for the most part, what is often termed the right, describing those who would give political authority to “the State”, particularly to institutions, such as the king or even the military forces, to represent the rule of law, abstract justice and market principles. Blue politics tend to be nationalist. Green would comprise those, such as the Greens or Islamic fundamentalists, who would give political authority to their god—Allah, for instance, or Gaia or the Awesome Majesty of the Forests—, and who would subordinate all human decision making to obeying the authorised and authoritarian hierarchs of the one true religion. Green politics, because of the various gods’ supposed unicity and universality, tend to be supranationalist. 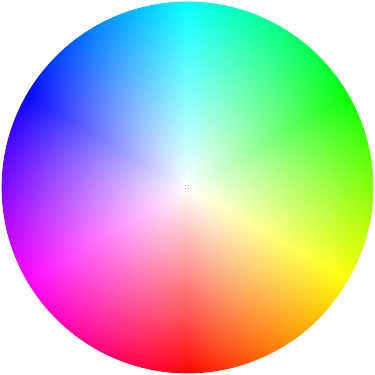 Between these three main colours are, of course, myriad mixed hues. Within the tripartite representation of politics extremes are placed together instead of being spread apart in the simple linear model; instead of the centre of a line suggesting similarities, the centre of the colour wheel—brightness of light—shews enlightenment: those who believe in the rights of the individual within the rule of law are brighter, those who subordinate the individual to autocratic control are darker. Centrists, who place equal importance to the people and authorities and religion but who support maximum individual, nomocratic freedom move towards being white; contrariwise, all extremists—whether socialist, tory or theocratic—are basically alike, and those of the darker, more extremist shades, whether ascribing absolute importance to the people (dark red) or the market or the aristocracy (dark blue) or their god (dark green) but autocratically permit no freedom for individual people (outside of the ruling class), are so close to being black as to be virtually indistinguishable. The fact that the professor uses this old cliché shows how little brain power he actually has. How does he assess Genghis Khan’s political beliefs, other than by assuming that anyone who conquers and kills millions of people ruthlessly must be right-wing? Were Stalin or Pol Pot right-wing? Was Genghis noted for a conservative adherence to royalty, or aristocratic privilege? Nope, he encouraged promotion based on merit. Was Genghis noted for supporting an established religious hierarchy or for having intolerant, racial views? Nope, he was particularly tolerant of religious and ethnic diversity. What makes Andrew Bolt right-wing? He claims, correctly, to be conservative, true, but a man can be conservative yet not right-wing. Even if Richard Lindzen had rather right-wing political opinions, why should that invalidate any of his scientific work? We might assume, for instance, that Wernher von Braun had (for a time, at least) right-wing opinions; did that necessarily invalidate his research on rocketry? Of course, Prof. Flannery was merely speaking in code: for him, and for most of his supporters, “right-wing” is just another term for “evil”. Rogue Operator has a post, “Debunking the Big Lie that American Conservatives Are Like Fascists”, which prompted me to establish this site. A similar, widespread error is that, whilst conservatives are right-wing, to support progress is to be left-wing; it is possible, after all, to be a conservative communist. All Right, All Right; The Friends of Carbon Dioxide; The Impact of Climate Change; Say “Yes” to More Taxes; Turn me on, Deadman; Ubi Libertas Ibi Patria.